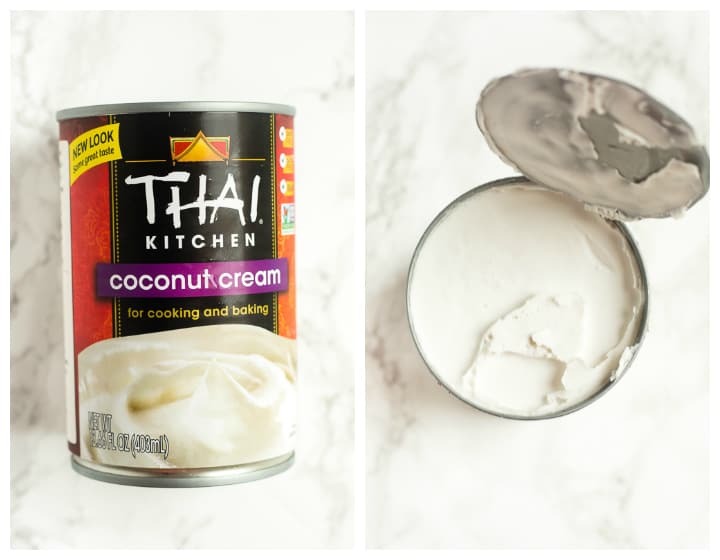 Did you know you can make coconut whipped cream from pure canned coconut milk? Coconut whipped cream is the perfect vegan or lactose-free substitute for regular whipped cream! A while back, my sister started following a new nutrition plan after several appointments with a holistic doctor to work on some different stomach issues. The diet is a high-fat (specifically, high-quality fats) healing diet, so it’s full of things like olive and coconut oil, grass-fed organic beef, almonds, chia and hemp seeds, and canned coconut milk. I’ve been interested in learning more about this diet (Maximized Living, in case you’re curious) because it’s counterintuitive for such a high percentage of your daily calories (in some cases, 50-60+%) to come from fat. In some ways, it reminds me of the Paleo diet, if you’re familiar with that. I’ve read some cool success stories from people who’ve followed this diet and been healed from lots of different ailments, and it sounds like it’s been effective. And for the rest of us, including some healthy fats in our diets is important, too. I came up with the idea of these strawberry and coconut whipped cream parfaits after seeing the idea of coconut whipped cream floating around Pinterest a few months ago. Coconut milk is highly encouraged on the Maximized Living plan and berries are actually one of the few fruits included in the plan because of their low sugar content and their cancer-fighting properties, so this turned out to be a delicious, healthy dessert that happens to be Maximized Living, Paleo, vegan, and lactose-intolerant friendly. It really tastes like the real deal- like whipped heavy cream with a hint of coconut! Here’s what you’ll need to make coconut whipped cream: a can of full-fat coconut milk (or coconut cream) and about a teaspoon of honey or confectioner’s sugar. I buy my canned coconut milk on the international aisle of my grocery store! To make coconut whipped cream, you’ll need the authentic, full-fat coconut milk or coconut cream to be able to whip it into stiff peaks. You may see light coconut milk, coconut milk, and coconut cream on the shelf. The only one you definitely want to avoid is light coconut milk, which is too watery for this type of recipe. 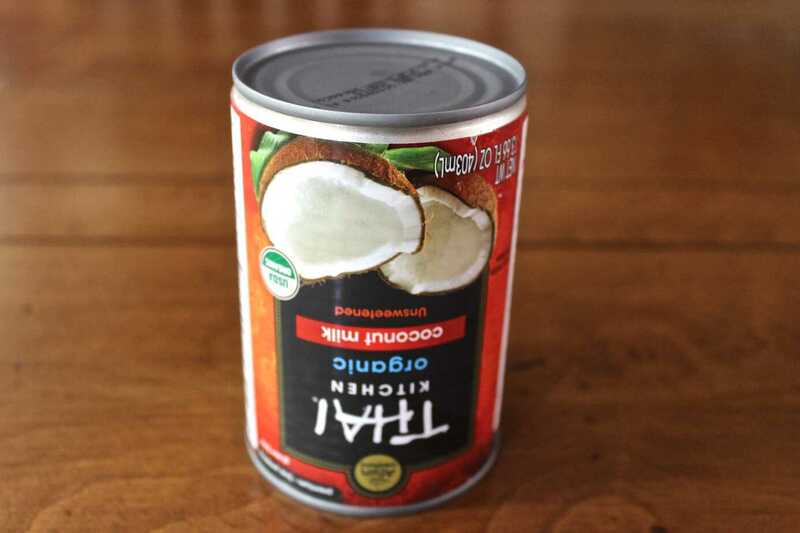 The main difference between the three types of canned coconut milk is their water content. For a recipe like this, coconut cream will produce the most whipped cream because it contains the least amount of coconut water, but regular canned coconut milk is a good option, too. Just make sure coconut is a main ingredient, rather than just water with coconut extract and a bunch of thickeners. First, flip the can upside down and toss it into the fridge for a few hours or overnight. 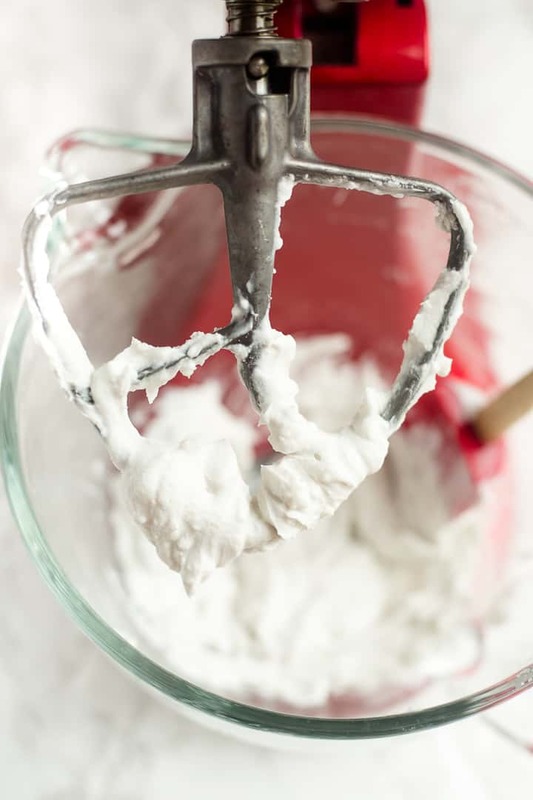 If you’re using a hand mixer, you can pop a medium bowl and beaters into the freezer 10 or 15 minutes before you start whipping the cream. The chilled mixer will help the cream become a little more stiff. I usually use my stand mixer, so I just freeze the beater briefly. After 8 hours or so in the fridge, you can open your can and you’ll see that the top of the coconut milk has solidified. Scoop the solidified coconut milk into your mixing bowl. Use the coconut “water” that remains in the can in smoothies! Beat the coconut milk solids for 3-4 minutes or until fluffy and creamy, adding a drizzle of honey if desired OR a sprinkle of confectioner’s sugar. 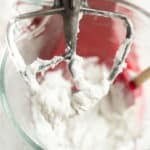 The possibilities for how to use your coconut whipped cream are endless– you can use it just about anywhere you’d typically use whipped heavy cream. 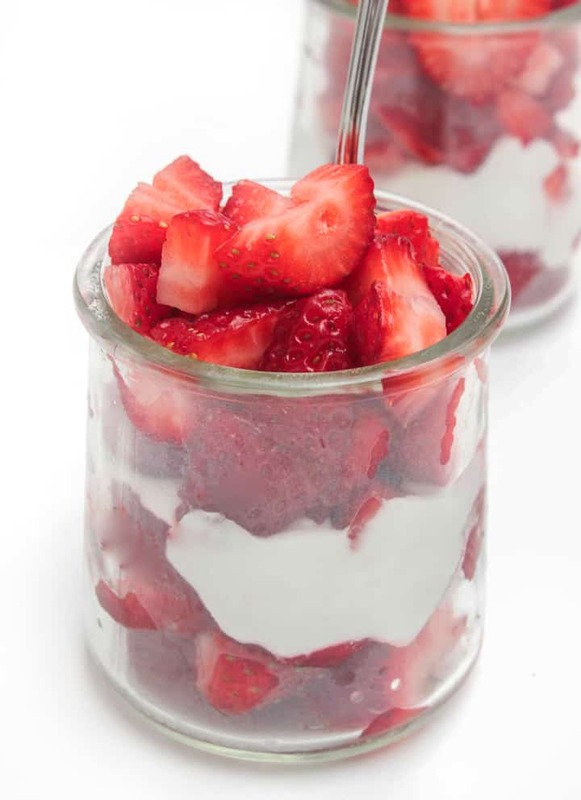 To make strawberry parfaits, just layer berries and coconut whipped cream into small jars or bowls and enjoy! If you try this coconut whipped cream, let me know in a comment or take a photo and tag me @livbane on Instagram! I’d love to see! Coconut whipped cream is the perfect vegan or lactose-free substitute for regular whipped cream! Flip the can of coconut milk upside down and refrigerate for at least 8 hours or overnight. Optional: chill beaters and mixing bowl for 10-15 minutes before whipping cream. Scoop solidified coconut milk into the chilled mixing bowl, leaving the coconut water behind. Beat the coconut solids for 5-8 minutes on medium speed until creamy, adding honey or confectioner's sugar if desired. If cream begins to thin, refrigerate it again, and it will thicken again, unlike normal heavy cream. 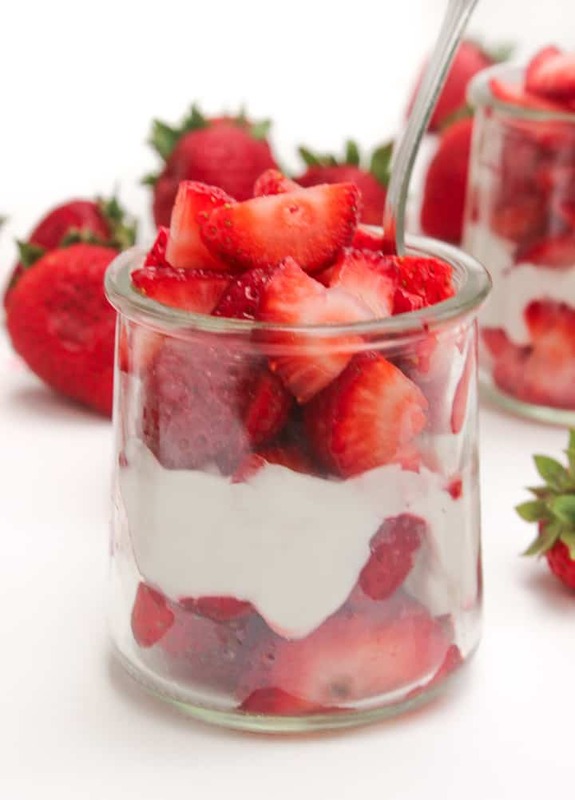 If making berry parfaits, layer berries and coconut cream in small jars or bowls and enjoy! Whipped coconut cream will stay good in the refrigerator for up to 4 days. I have a can of coconut milk in my pantry that I have no clue what to do with! I will have to try this! It’s so easy and I didn’t know it was even possible. I love coconut whipped cream. We put it on top of a gluten free chocolate cake the other week. Yum! I’ve always wanted to try doing it, but have yet to do so! Haha! So good! I have seen this so many times and everytime I am about to make it I forget the coconut milk at the store, but berries and whipped cream would be the perfect dessert for all the summer temps! Strawberry shortcake is an AWESOME idea! I’ll have to try that next. This looks delicious! I’ve only made regular whipped cream. Ooh, this looks really good! I don’t need to do dairy free, but my dad does, and I also LOVE coconut, so I’m a big fan of coconut cream. Favorite way to have coconut might be coconut cream on fruit or cookies or coconut on German Chocolate cake. Mmmm, German chocolate cake! <3 That's so cool that you already knew about coconut cream and had had it- I'd never heard of it until recently! WOW! This looks awesome! What a delicious recipe! And I’m so interested in this diet that your sister is following! I don’t eat that much high fat foods, but you’re SO right! They are very healing and we do need them! I’m gonna start adding some! …also, I don’t eat dairy, so I’m excited about this coconut milk cream! I LOVE coconut milk ice cream! YUM!!! I bet coconut milk ice cream is delicious! Yum!! I have seen this before and wanted to make it, but never have. You just reminded me how easy it seems to be to make! Trying it this weekend! My favorite use for coconut is in almond joys. Chocolate, almonds and coconut? BLISS! Hi there! I’m late to this post, but that’s ok. This looks amazing – exactly like standard whipped cream! I’ll definitely make this next time I volunteer to bring dessert to a dinner event 🙂 Thanks! On another note – over the winter I worked with a biosignature coach who focused on repairing my digestive tract. The diet was heavily focused on fats. Each meal had protein, veggies, and a LOT of fat. It was zero starchy carbs for 2 straight weeks (not fun), but the goal of improving digestion and nutrient absorption was worth it. In two weeks my body fat dropped 3% and I felt better overall. It wasn’t maintainable for me for the long haul, as carbs are needed for muscle growth, but it changed how I eat to this day. It’s also changed how I coach my athletes and weight loss clients. There’s a lot to be said of healthy fats and how helpful they can be! Thanks for sharing 🙂 Happy weekend! That’s so interesting to hear, Ashleigh! Thanks for sharing your story. Before recently, I had no idea how great healthy fats can be. Thank you, thank you, thank you for this post!!! I’ve tried to make coconut whipped cream soooo many times and it never looked quite like I hoped it would. I thought, that it simply wasn’t possible to get it right but now I not only know that it CAN be done but also HOW. THANK YOU!!! I’m so glad this post was helpful. From what I’ve heard, the ingredients in the brand of coconut milk you buy make a huge difference in whether or not the milk whips well. Hope it works for you next time! Not sure if you still check these comments, but can anything be added to the cream to make a frosting? Melted chocolate chips/cocoa powder? I need to be dairy free but I love to bake and am looking for frosting options!! Hi Natalie! Unfortunately, I haven’t tried using it as a frosting and am not sure if it’d be sturdy enough to hold up in say, a layer cake. I think adding melted chocolate chips or cocoa powder could definitely help, and I’d imagine that powdered sugar would as well since traditional frostings are always loaded with that. Sorry I can’t be more help, but I’d love to know how it goes if you try it! How long do you think it will stay fluffy? If I made it the night before would it last until the following afternoon? Hi Nicole! In my experience, the coconut whipped cream has actually stayed fluffy longer than regular whipped heavy cream, so it should definitely last overnight! Coconut Whipped Cream is delicious! You can also make it into chocolate mousse! It’s so yummy! Here’s the link! YUM, I can imagine how wonderful it as as chocolate mousse! Thanks for sharing the link, Stacy! We are making your recipe tonight to go with fresh berries from the Farmers Market! Thank you for sharing this post ! Can I add dark melted chocolate? I haven’t personally tried it, but I bet that’d be even more delicious! If you made a chocolate layer cake and put the coconut cream on top of the bottom layer, then put the top layer covered with a chocolate frosting (with or without nuts) on top, followed by an additional layer of coconut cream, I think you would have a very tasty dessert. This might have to be kept refrigerated. That’d be amazing!! And yes, I’d definitely refrigerate it! Wow! This is exciting. I have never tried making my own whipped cream. Can’t wait to try this on Saturday.